In humans and animals, the ear actually serves other functions beyond hearing. Echolocation – Some blind people can learn to navigate using echoes of the sounds they make themselves. That’s why you will see blind people tapping their sticks on the ground. They analyze the echoes made from these sounds to determine the proximity of nearby surfaces. Balance – The inner ear is the home of our balance system. There are three semicircular canals in the inner ear positioned at right angles to each other like a gyroscope. They are able to sense changes in movement of the body. With such changes, endolymph waves within the canals cause hair cells located within their base to move. Position of the head is sensed by hair cells of the utricle and saccule which is stimulated when the head moves and the relationship to gravity change. This is why inner ear problems can lead to vertigo, labyrinthitis or Meniere’s Disease. Cooling – In elephants, the ears are used as a cooling instrument. The large ears radiate heat to help keep the elephant cool. Directional Hearing – Great Horned Owls possess a unique type of directional hearing that allows then to focus on their prey with precision. 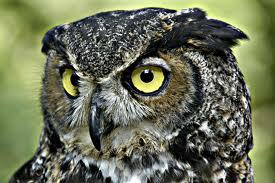 The owl’s ears are on the top side of its head and provide acute hearing. Their hearing picks up even the faintest sounds, which enables them to take prey in complete darkness. Do you know of other functions of the ear? In humans or in animals? This entry was posted in Audiology Awareness, Audiology Trends. Bookmark the permalink.